Home / Learn. Save. Retire. Learn.Save.Retire is a U.S. Chamber initiative designed to advance bipartisan support for steps to make it easier for small businesses to offer retirement plans and enable middle-class savers to better plan for their future. 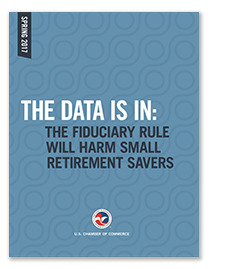 As part of this initiative, the Chamber is advocating for a fiduciary duty rule that doesn’t limit access to affordable retirement advice or retirement products. Proposed Regulation Best Interest: The SEC is proposing a new rule to establish a standard of conduct for broker-dealers when making investment recommendations to retail customers. New requirements beyond the existing suitability requirements for broker-dealers under this proposal include mitigating and eliminating conflicts of interest, enhanced duty of care obligations, and additional disclosures to investors. Proposed Form CRS and Additional Disclosures: The SEC is proposing to require broker-dealers and investment advisers to provide a four-page relationship summary to retail investors to inform them about the relationships and services the firm offers, the standards of conduct, the fees and costs associated with those services, and conflicts of interest. The SEC is also proposing to restrict broker-dealers from using the term “adviser” or “advisor” in certain circumstances. Proposed interpretation of the Standards of Conduct for Investment Advisers: This proposal explains the SEC’s interpretation of investment advisers’ existing fiduciary obligations and considers potential enhancements to their legal obligations where the current broker-dealer framework provides investor protections that may not have counterparts in the investment adviser context. To explain some of the different types of business models and services available to investors, CCMC developed a video and infographics highlighting profiles of different investors and sharing the stories of how they invest. This research, conducted by the U.S. Chamber of Commerce, is based on interviews conducted with companies providing financial advisory services and products, including broker-dealers and firms that are dually-registered as broker-dealers and investment advisors. This research, conducted by the U.S. Chamber of Commerce, is based on the opinions of financial investors working with financial professionals. Key stakeholders have surveyed the financial industry, who serve millions of retirment accounts, to determine the real world impacts of the Department of Labor’s Fiduciary Duty Rule. On March 15, 2018, U.S. Court of Appeals for the Fifth Circuit ruled in favor of the U.S. Chamber and its fellow plaintiffs striking down the DOL rule. You can read the U.S. Chambers statement here. On Wednesday, April 18, 2018, the SEC released its Best-Interest proposal. Read CCMC’s statement here. 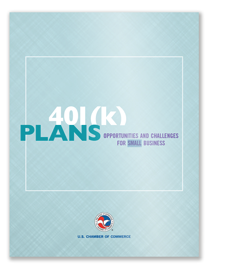 This U.S. Chamber retirement white paper takes a look at what it takes for a business to start a 401(k) today and why we need to simplify small business retirement plans, highlighting both the opportunities and challenges faced by entrepreneurs as they look to provide high-quality benefits for their employees and enable savings for their future. This U.S. Chamber retirement white paper outlines the ways state auto-IRAs will hurt the small business workers they are supposed to help and highlights how workers benefit from strengthened and expanded employer-provided plans. 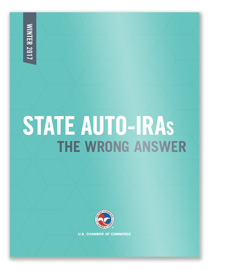 It details why state auto-IRAs are the wrong answer; looks at problems presented by state auto-IRAs; and provides alternatives for improving access to employer provided plans. 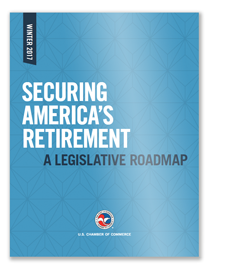 This U.S. Chamber report details policy solution proposals Congress can act on to achieve better retirement security for workers. It’s focus is on strengthening the voluntary employment-based retirement benefits system and enhancing retirement security for workers, while proposing solutions to address the evolving demands of our country’s workforce—an important and pressing issue that policymakers will need to tackle in 2017. The SEC should ensure investors have access to different types of services and products and fully understand the choices they are making.